A Magical Experience for Nature and Animal Lovers! Imagine watching a giant Pacific sea turtle pull herself up to the ocean shore just after dusk. Her 400-pound body will slowly make its way up the crest of the beach, and the entire time she is oblivious to your presence. Then, this mother starts digging a large hole, dropping between 65 to 90 eggs into it. She’ll cover the hole, hoping to protect it from predators, and then return back to the ocean. 60 days later, her babies will be born. This is an evening sea turtle nesting tour, and depending on where you’re staying, you’ll be taken to either Pirate’s Bay beaches, Playa Ventanas, Playa Minas or Nombre de Jesús. You will first be registered at the park station before you witness this incredible feat of nature. The local guides—turtle spotters—will let the guide know they have a turtle preparing for nesting, and (s)he will inform you of the proper ways to observe and respect the mothers. Typically, you will see between 4 to 6 turtles on this trip. Please note that lights affect nesting females and hatchlings so cameras are forbidden! 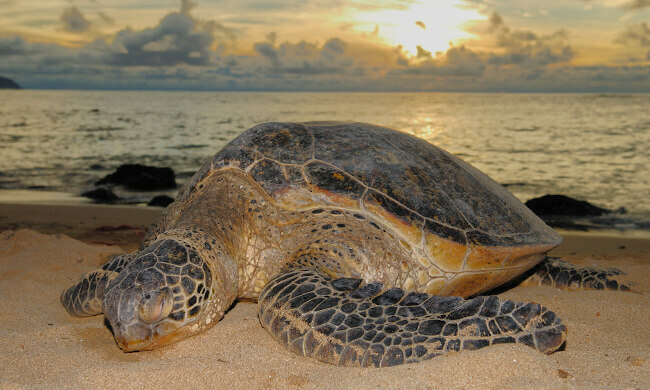 This is a great trip for anyone who wants to observe sea turtles in their natural habitat. We recommend that children be at least 7-8 years old and should have the patience to wait for extended periods of time for the turtles. Our tour ends chatting with your guides, having sandwiches, and taking a ride back to your hotel. Includes: Transportation to and from the hotel, guide, water bottle, flashlight, entrance fees, sandwiches.